This is something that evolved from the 9/11 attacks, like artificially low interest rates and the resultant 2008 Wall Street financial crisis. Tellingly, Peace Prize Obama made an effort to explain the background and legal justification for his AfPak war policy in his West Point speech of December 1st, 2009: “Just days after 9/11, Congress authorized the use of force against al-Qaeda and those who harbored them”an authorization that continues to this day.” In other words, the authorization for war in the Middle East is open-ended, to be determined and interpreted by the White House as it sees fit. This includes US air attacks in Pakistan or anywhere else. No further authorization is needed. With Libya, the White House has gone one step beyond. 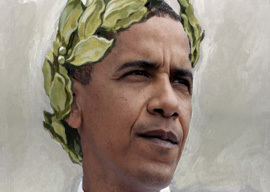 Obama is utilizing the fig leaf of a non-unanimous UN resolution. He bypasses the US Congress entirely. This is a further precedent for future wars of choice by the executive branch with no oversight whatsoever. Anything goes. My guess is that the White House, having been blindsided by events in Egypt, Tunisia, and Bahrain, wants to co-opt the so-called “Arab Spring” going forward. Washington wants to take credit for this spontaneous movement, to channel and control it. Washington gave Mubarak and Gaddafi wholehearted support for years; the former because he was in bed with Israel, the latter because he sat on an ocean of oil. Now they are expendable simply because they have outlived their usefulness or viability. To date, there has already been substantial destruction of infrastructure and adverse consequences for civilians due to the fighting and bombing. The Libyan economy is in shambles. Foreign corporations and workers have rushed to the exits. Food and medicine are in short supply. We may be on the threshold of a humanitarian disaster. What is the plan in the event Gaddafi, his family, and their tribe hunker down? Conservative MP Rory Stewart offers further insights and warnings””Here we go again””in the current issue of the London Review of Books. This past weekend produced an informative article in The New York Times concerning French President Nick Sarkozy and the boulevardier “philosopher” Bernard-Henri LÃ©vy. According to this report, it was these two social climbers” joint leadership which brought about the Western intervention in Libya. Although Monsieur BHL is considered to be a charlatan and a jackass by some, that does not rule out the possibility that he could be right on this issue. The article tells a credible story, not denied by the principals, that it was the grandstanding LÃ©vy who persuaded the hyperactive Sarkozy who persuaded the smooth-talking Obama to jump into Libya. At bottom, this was a French dÃ©marche, with Obama providing the necessary military firepower and the UNSC enabling. If so, I’m all for it. I mean, I would have been all in favor of letting the French, the Brits, and the Italians take care of this matter. They have enough firepower, at least when it comes to Libya. The Mediterranean should be considered a European lake, and Libya is a former Italian colony. My guess is that Hillary and Obama could not stand the idea. The notion of Europe actually doing something on its own for a change was anathema and a threat to the Washington foreign-policy establishment. Team Obama had to get involved. Their egos demanded it. So here we are, for better or worse.